If you want to fly cheap in Vietnam, VietJet is often your best bet. But this holiday season, I won’t be flying on the low-cost airline, due to an unfortunate incident last December that left me wishing I had a pair of ice picks with which I could stab myself in the eardrums. It was December 30, 2015. I had just flown from Danang to Saigon – a flight that, in theory, should take 50 minutes. In say “in theory” because, in my experience, VietJet doesn’t just offer great prices; they also treat their passengers to pre-boarding ceremonies, consisting of four hours of announcements that your flight has been delayed another 30 minutes. But it wasn’t the pre-flight delay that made me wish I had a pair of ice picks (one per ear). It was the post-flight delay. On this particular evening, as we taxied to a far corner of the runway, approximately halfway between Saigon and Danang, the New Year song began to play. It stopped momentarily, so our pilot could make an announcement that we had to sit on the runway for a while, because, due to our delayed arrival, there was no gate where we could park the plane. Then the song came back on. 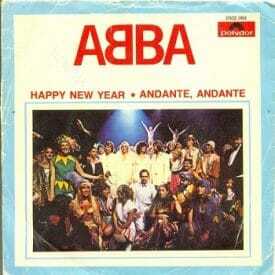 I had never liked the “Happy New Year” song. Now, trapped in my budget-airline seat, the lyrics began to register as I listened to them over and over. I looked at my wife, Kattina. “Did they just sing, ‘We might as well all lay down and die?” I asked. The looping music continued. For thirty minutes, we sat, forbidden from leaving our seats on this remote scrap of runway, as the dreadfulness repeated, over and over. Currently trapped on a VietJet airplane on the runway in Saigon. Just flew in from Danang. No gate available so we have to sit here. On any other airline, it wouldn’t be so bad but VietJet’s music loop makes me want to stab my eardrums with ice picks. Ah, so it’s begun! Enjoy hearing this song all day, every day, everywhere in the city, until after Tet. It was the day before New Year’s Eve. Tet, the lunar new year and Vietnam’s biggest annual holiday, was more than a month away. The more I listened, the more flashes of depressing lyrics I began to catch. I Googled the words to find out who had composed such a disaster. I glared at the Swedish family across the aisle, mumbling Norwegian obscenities under my breath. Finally, after what felt like a decade of torture, our plane’s engine fired up and we chugged to a different part of the runway, where a bus picked us up and delivered us to the terminal. “We had to sit through 30 minutes of that before we could drive to another part of the runway?” I said. “Maybe The bus didn’t have enough gas to reach us where we were parked,” Kattina replied. I later discovered Nick was right. Various versions of this song assault Vietnam throughout the holidays in every grocery store, restaurant, and, I imagine, brothel. The difference between those businesses, versus an airplane, is you can leave. As a foreigner living in this otherwise delightful country, I must give VietJet the benefit of the doubt. Their intentions, I assume, are not actually to encourage their passengers to lay down and die. My other guess is the same person picked out the “Hello Vietnam” song VietJet plays during the rest of the year. That song, recorded by Vietnamese-Belgian singer Quyen Anh, tells the story of a person of Vietnamese descent who longs to one-day visit her country of ancestry. It too plays over and over, in a single-track loop, before take-off and after landing on Vietjet flights throughout the rest of the year. 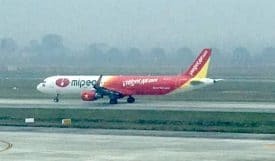 And so, to reiterate, if you are wanting to fly cheap in Vietnam, VietJet is an excellent choice, as long as you are not in a hurry and are deaf. To the rest of you, be forewarned: aviation regulations forbid you from cranking up your own music on your headphones during take-off and landing. And ice picks are forbidden on airplanes. My Vietnamese gf and I flew VietJet last year because it was, by far, the cheapest flight available. During the first flight she turned to me and asked, “Can we never fly VietJet again?” She later said she’d rather ride the bus for 7 hours from Da Lat to Saigon than fly on VietJet.